Author’s Note: Unfortunately due to the nature of this series, I will have to spoil a couple of things from the original Steins;Gate. This review will assume that you have finished either the anime or the visual novel. I will try not to go to deep into spoilers for this one though. 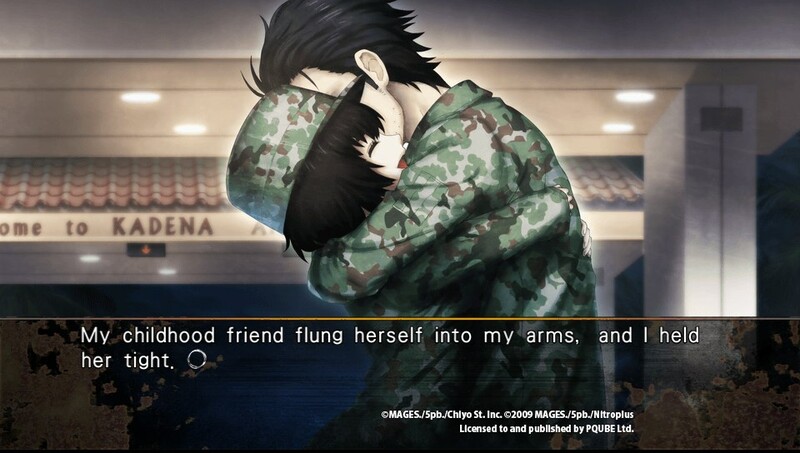 The long awaited follow up to popular visual novel Steins;Gate has arrived and I got to play it on my Vita. 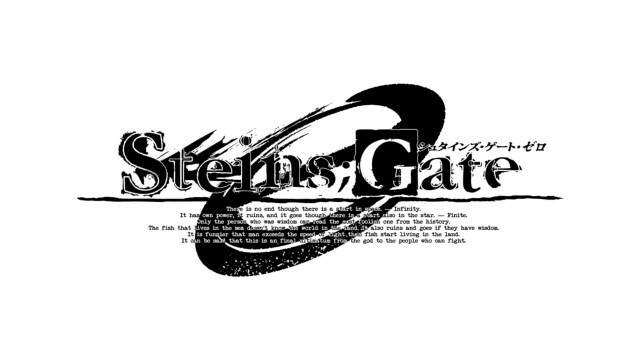 Having seen the Anime first and then read the Visual Novel, I am very familiar with the universe of Steins;Gate along with many of the concepts and terminology the game presents to you. It is no exaggeration when I say that Steins;Gate represents some of the highest quality of storytelling and world building I have ever seen. I am also happy to report that Steins;Gate 0 does a pretty good job following up on its precursor’s success. Steins;Gate 0 works as a means to complete the story told in the original Steins;Gate. As you know there are two timelines, alpha and beta, and when they converge we achieve Steins Gate or the timeline where both Mayuri and Kurisu won’t die. 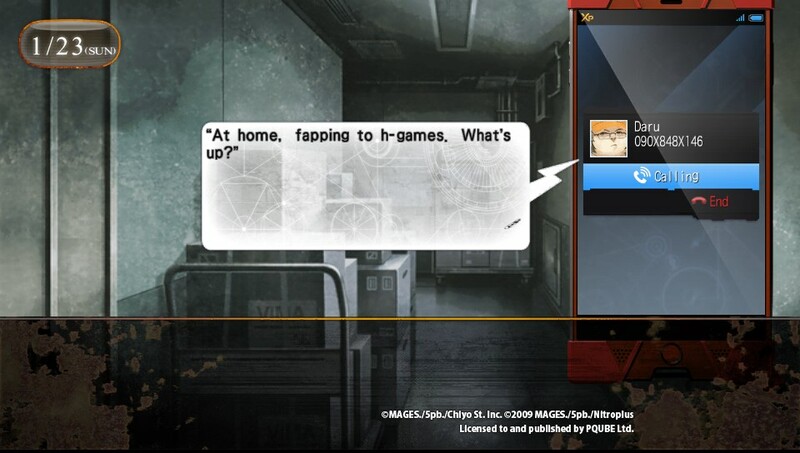 Okabe received a video D-mail from himself in the future telling him what he needs to do to accomplish this. 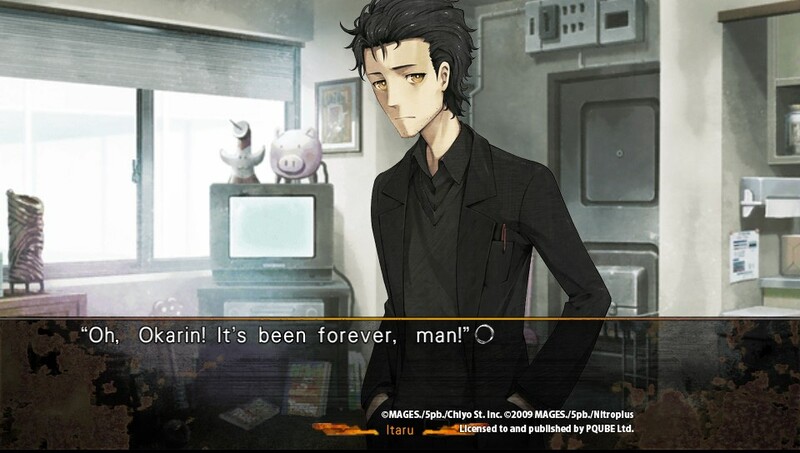 However, for Okabe to reach that point he has to go on a journey….and that journey is precisely what this visual novel describes. Steins;Gate 0 follows the timeline where Okabe accidentally killed Makise Kurisu and her father ran off with her papers on time travel. Okabe now suffering from massive guilt and PTSD, is basically a giant hot mess. The man is beyond depressed and this is reflected in many of the things he says and the way he interacts with the rest of the cast. This may sound like a recipe for an over-melodramatic lead seen in many RPGs, but it’s actually done quite well here and written to the point where instead of it being annoying, it’s actually really compelling and at times downright heartbreaking. Compared to the slow buildup of the first one, Steins;Gate 0 hits you hard right away and keeps you on the edge of your seat for the whole ride. Don’t worry though; the story isn’t all sadness and depression. There are just enough lighthearted and humorous scenes to break the flow and give you a much needed reprieve from all the drama. One of my favorite scenes is when Daru actually goes on a date with *gasp* Suzuha’s mother! That’s right, her mother is revealed in Steins;Gate 0, which is actually one of the few problems I had with the story. In the first one, Suzuha specifically did not want to reveal much about her mother to Daru or any of the lab members. In 0, not only is her mother revealed in a very anticlimactic way, Suzuha seems to not care as much about discussing her with Daru and Okabe yet the story still treats it as a big deal. When you find out who it is, you will be saying to yourself: “Wow, that’s it”? Considering how much they were building up to it in the original Steins;Gate, this reveal felt underwhelming. There are a couple of new characters and they are fairly enjoyable. The art style used in this game is a lot more “anime” so to speak but still looks great. The CGs are also very colorful and well drawn. I would not mind using a few of them as wallpapers. 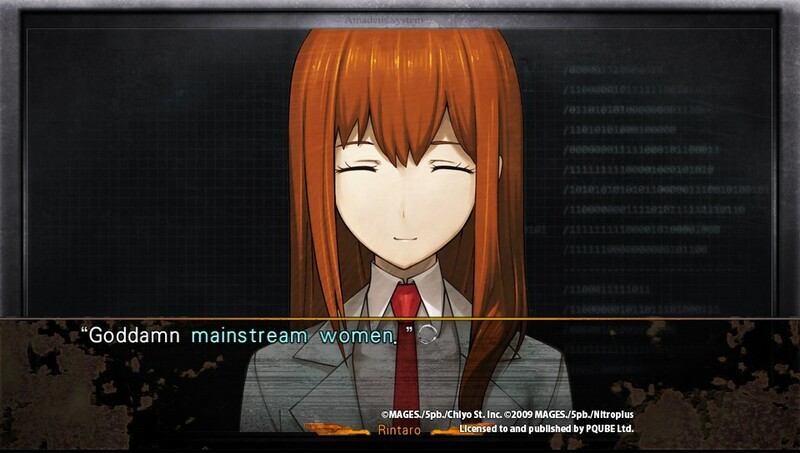 Steins;Gate 0 has six endings but in order to see the true conclusion, you need to reach a very specific route. I would elaborate more on this, but that would lead to some late spoilers. I found the endings to be very memorable and think it is well worth your time to see all of them in order to get the most out of the story. There is also an in-game glossary giving further details to much of the terminology used in the game. It’s clear the writers definitely put a lot of thought into the game’s world and for the most part it’s very well written. Honestly, it’s far more interesting than most books I’ve read. There are a lot of allusions to real world events which only enhance the experience as it gives the universe a sense of realism rarely seen in time travel stories. If there is one downside to the overall package, it is the localization. While I have seen worse, Pqube really needed to make a better effort in polishing and proofreading their English translations as I noticed some typos and “weird phrases”. If you can look past that, it’s still a really good read. Overall, Steins;Gate 0 is a fantastic time if you are a fan of the original Visual Novel or the Anime. It should take you about 35 hours to see everything but as I mentioned before, ALL of the paths are well worth exploring. However it is also mandatory for you to be familiar with the original one in order to fully understand it. At $40, it is a hell of a ride and also a very memorable one. Get it on the Vita so you can bring it with you wherever you go and spread the word on this fantastic series!